Winchester Hospital is proud to offer the most advanced therapeutic and diagnostic imaging services, led by a team of highly skilled general and specialty radiologists, nurses, technologists and support staff. to evaluate bone health, or an MRI to evaluate painful joints or muscles, Winchester Hospital offers advanced diagnostic imaging technologies to meet the ever-changing needs of our patients and the broader community. test is a quick and painless test that uses small amounts of radiation, less than a chest X-ray, to determine the thickness of certain bones. Learn more. CT Scan – Computed tomography, also called CT or CAT scan, is an x-ray procedure that uses a computer to generate cross-sectional views of the body. Learn more. Fluoroscopy – A technique used to capture imaging in motion. It is used for evaluation of the gastrointestinal track (upper GI) or for special procedures. General Radiology – Diagnostic X-ray to perform general examination such as a chest X-ray at multiple locations with flexible hours of operations at Winchester Hospital. 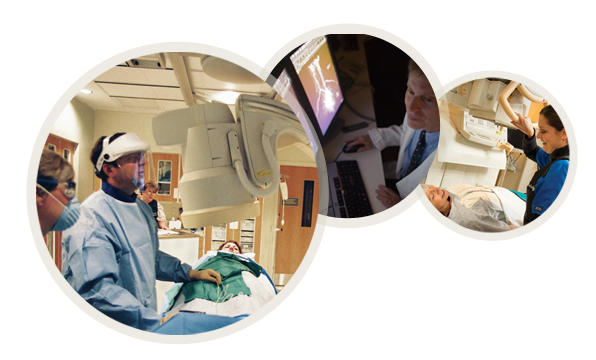 Interventional Radiology – Interventional radiology involves minimally invasive procedures such as angiograms, angioplasty, stent placement, fluid drainage and more. Winchester Hospital has a state-of-the-art angiography suite and expert interventional radiologists. Learn more. Mammography – Winchester Hospital’s mammography screening sites not only have flexible hours, but also some of the most highly-trained, caring clinicians in the area. Winchester Hospital's mammography sites are licensed by the Department of Public Health. Learn more. MR Arthrogram – An arthrogram is an X-ray examination of a joint (such as shoulder, hip or wrist) that uses a special form of X-ray called fluoroscopy and a contrast material. An MRI performed immediately after the injection of the contrast material is called an MR arthrogram. Learn more. MRI – Magnetic resonance imaging, or MRI, uses a magnetic field and radio waves together with a computer to create cross-sectional, three-dimensional pictures of the inner body. Learn more. Nuclear Medicine – Nuclear medicine is unique because it shows how organs and tissues are working. There are more than 50 different nuclear medicine examinations to assess organ function. Learn more. PET/CT – PET/CT is a diagnostic imaging procedure that provides physicians with information about the body’s chemistry, cellular function and exact location of disease, to help make an earlier diagnosis or to determine the effectiveness of treatment. Learn more. Ultrasound – Ultrasound, also called sonography, uses high-frequency sound waves to obtain images from inside the human body. Learn more. Vascular Tests – Vascular tests of the arteries and veins in the arms, legs and neck are painless and require no needles, dyes or X-rays. Winchester Hospital’s Vascular Lab utilizes state-of–the-art imaging equipment to assess blood flow. Learn more. Virtual CT Scan Colonoscopy – Virtual colonoscopy uses a CT scanner to visualize the large intestine, allowing an interior view and three-dimensional model of the bowel. Learn more.